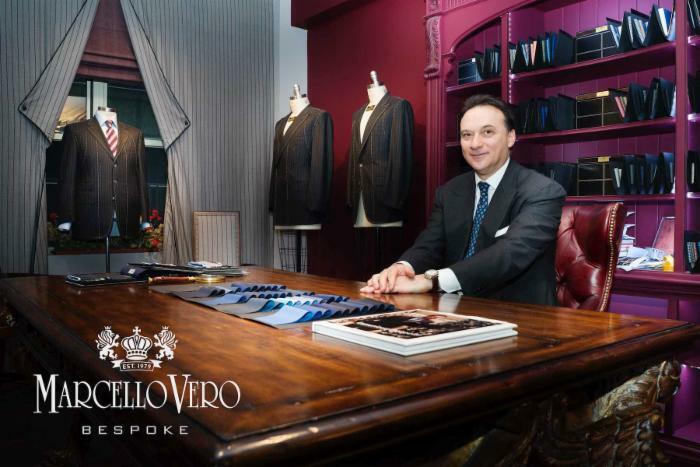 Founder of the brand MARCELLO VERO, Marcello Vero recently opened his Atelier on 57th Street in New York City, where he creates luxurious, custom wardrobes for his long-standing and new clients. These personalized, functional, timeless custom men’s wardrobes are perfect for every occasion. Marcello brings many years experience and high-level expertise in the world of fabric, tailoring, design, image consulting and client service. Prior to creating the MARCELLO VERO collection, he was founder and director of the unique KITON Custom Service at Bergdorf Goodman Men’s Store in New York City, where he created the successful custom working process and established the clientele base for Bergdorf Goodman and KITON. Marcello is a professional wardrobe designer and an image consultant certified by the Fashion Institute of Technology in New York, where he has also presented seminars on luxury custom-tailoring clothing production to new F.I.T. students in the men's division. Marcello has also given seasonal training seminars for Bergdorf Goodman's sales associates on how to sell luxury men's custom wardrobes for an elite clientele. Marcello understands the intricate details of the best fabrics and suit manufacturing. His superb sense of classic elegance in men’s clothing, 32 years of international experience, and technical skills make him one of the world’s authorities in the luxury men’s classic clothing industry. Marcello Vero’s clients include entrepreneurs, Presidents, CEOs, and top executives of Fortune 500 companies. He has been featured on CBS, and in many publications such as, New York Times, Financial Times of London, Capital, Avenue, and Gotham New York. Email marcellovero@marcellovero.com or call Marcello Vero at 212-439-6282 for a private consultation. Marcello Vero was founder of the Kiton custom service and former director of first and unique Bergdorf Goodman's Kiton Custom Shop. Marcello has created the custom working process system and the clientele base for KITON and Bergdorf Goodman, generating over 12 Million of sales in over 10 years of successful business. Marcello is a professional wardrobe designer and an image consultant certified by the Fashion Institute of Technology in New York, where he has also presented seminars on luxury custom-tailoring clothing production to new F.I.T. students in the men's division. Marcello has also given seasonal training seminars for Bergdorf Goodman's sales associates and personal shoppers on how to sell luxury men's custom wardrobes for an elite clientele.